OMG! Tomorrow is Black Friday already! How did this happen? Usually I kind of pick up things year-round for people as I see them. I used to have a “Christmas bag” that would come in handy for those last-minute gifts I always end up needing. Last year I did something new and prepped with a list of brands, styles and sizes at Black Friday sales at Tysons Corner malls. I was even giddy during that night’s/morning’s bustling shopping ventures. I’ve heard such shopping ventures compared to the Running of the Bulls at Pamplona, Spain and I couldn’t wait for the stampede. There I was in one of the two Macy’s I visited with gorgeous accessories thrown off of racks, toy shelves all in disarray, designer clothes left near long register lines from shoppers who just didn’t have the fortitude or the patience to hang in there. It was exhilarating having my iPhone in one hand and my credit card in the other. My goals were in sight and there was not going to be an empty space under that Christmas tree. The feeling of being with fellow store conquistadors was satisfying. It was as if we all knew each other in those stores: handing out brand advice, passing on shopping passes and coupons and strategizing for our next consumer targets. Sometimes, it was a small nod from a fellow harried mom as I touched a certain rack, and then she would move her eyes to another section that had even more discounted items. Ooooh — the thrill of the shop! It was fun, tiring and well worth it. Happy Pre-Thanksgiving! 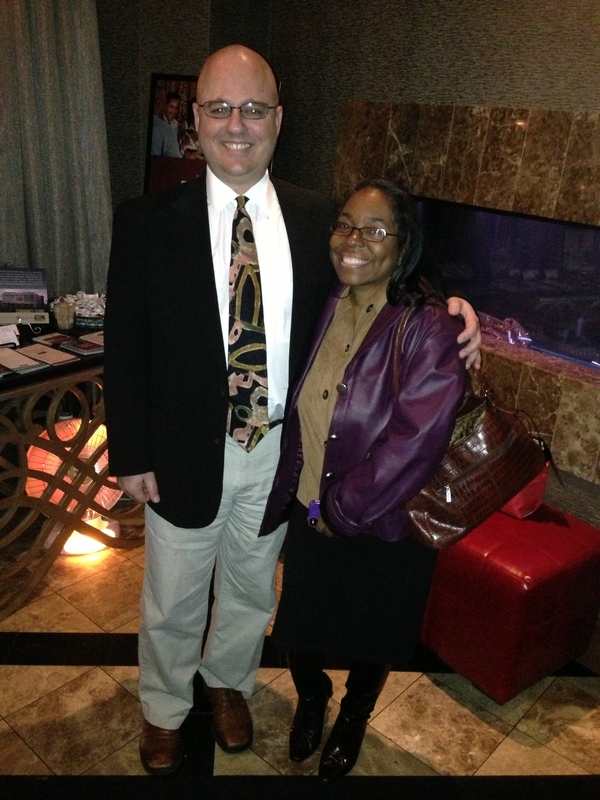 Todd and I at Ruth’s Chris, Nov. 21, 2012. 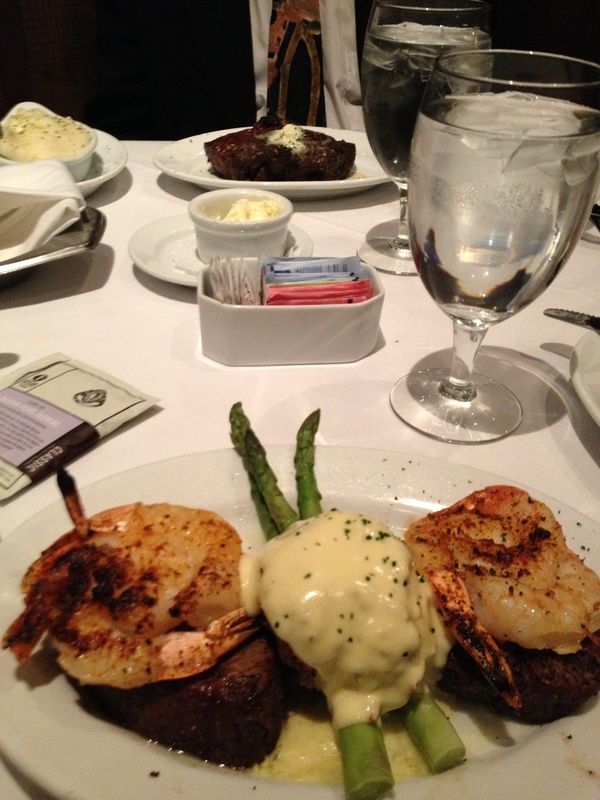 Our wonderful dinner: Ribeye steak, mashed potatoes, 6-ounce filets, jumbo shrimp, asparagus and a crab cake. The pressure to make a perfect meal was taken away by our beautiful meal that included steak, lobster, shrimp and crab — even the herbal jasmine tea was spectacular. Mmmmm …. 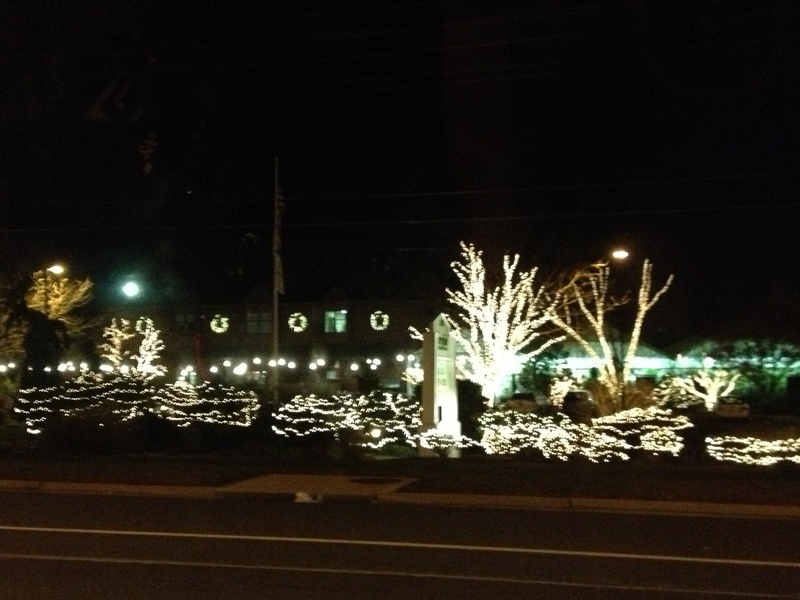 Ruth’s Chris…. But the pressure to buy the right presents is definitely there this year. Yeah, I have a sorta, kinda list with gift ideas, but nothing that has grabbed me as in years past. My nose for deals and brand comparison seems to be off this year. It has been a blur of a year for all of my family with my mother’s passing. I don’t even know how my oldest sister Carol does it all in Philly: taking care of the house, my daughter and herself every day. Plus, my daughter Torie’s birthday is Nov. 28th, so it adds to the gift-perfection urgency. The real pressure is in thinking about Torie’s face and all those of loved ones when they open their gifts and seeing joy and satisfaction because they know that I not only heard their hints, but honestly observed them with love and know what they need. That is absolutely priceless. That’s the fun in giving for me. And with my mother not being in the house, I feel like we have to take our holiday traditions to another level — something deeper, more real and with true warmth. I recently read an article where Rebekah Pershing, psychologist with Bethesda Family Practice Center in Cincinnati, says that the holidays create a “grief bubble,” a short period of time during which things such as songs or scents can bring back memories of who has been lost. “Then it all comes back to you, and it’s raw,” she says. Pershing goes on to recommend positive thinking, practice being more giving and taking good care of yourself during this time. 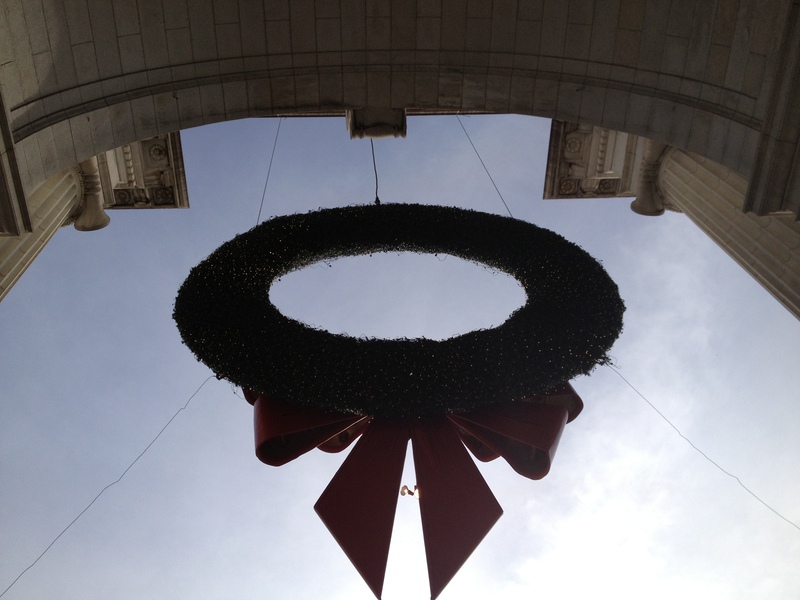 But, oh, her most poignant tip to battling holiday stress: Lower your expectations. Woah, now that’s going to be hard for me, but I will try. 1. Ask family members to put into writing the things they enjoy most about the holidays. Post everyone’s list where it can be easily seen. Then, put your energy into these things and let go of the rest. 2. Talk about past holidays. What worked? What didn’t? Start new traditions. Forget about the old ones that are long on work and short on real meaning. 3. Do something special for someone in need. This makes for a memorable project and most likely will leave you feeling much better than any party, decorating challenge or gift exchange. 4. Do less, spend less. Rest more, enjoy more. 5. Take care of yourself. Get enough sleep. Eat when you’re hungry; stop when you’re full. Eat whatever you love, but in moderation. If a gift of fruitcake doesn’t look appealing, don’t eat it! 6. Avoid alcohol or limit it to one drink a day. 7. Find a way, every day, to get at least a 15-minute session of brisk exercise. It will help keep your waistline in check, give you more energy, keep your mind clear and reduce stress. 8. Find enough time alone; time with spouse, children or those closest to you; and time with other people, to enjoy the holidays with friends, folks at work or in community activities. 9. Promise you’ll take a holiday from the life-draining “Five C’s”: criticizing, comparing, complaining, competing and correcting others. Spend more time complimenting others and caring for those in need. 10. Don’t fight it. If you simply “hate the holidays” to the point of getting depressed, consider a vacation and bypass the whole affair this year. I hope everyone enjoys their holidays — I know that I will definitely try. Tags: Black Friday, Christmas, coping, DigiWriMo, gifts, grief, Macy's, NaBloPoMo, Ruth's Chris, shopping, stress, Thanksgiving, Tysons Corner. Bookmark the permalink. Previous post ← Happy Birthday Marine Corps!